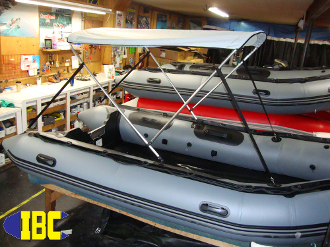 Get out of the hot sun and cold rain with a Bimini Top for your Inflatable Boat. The two bow system is easy to put up and take down by one person, and it stows in a convenient sock while folded down. Grey Performance Fabric for ultimate duability. shipping size 69"X15"x4" 17 lbs.